My apologies, I haven’t written about any wines or dishes I’ve made. It’s not that I haven’t been drinking or eating, I’ve just not been writing it down. Because our work schedules have been polar opposites, Mitch working nights and me working days, I’ve fallen in a sort of rut, making dishes that are quick and easy or a huge crock pot meal that we will eat on for days. (Boring) The good news, a new shift bid came out and our schedules will be closer together, not exactly the same, but at least we will be on the same sleep schedule. I am already planning some new menu ideas. Last night for dinner, I grilled boneless pork ribs and a mixture of bell peppers and onions. I opened a bottle of the Limited Release Apothic Rosé for a light wine to accompany the dish. A California wine from Modesto, vintage 2016 was a pale peachy color in the glass. I could smell a whiff of alcohol and strawberries. The wine had 12.5% alcohol by volume. The wine tasted of strawberries and watermelon, but not a sweet wine, more of a soft smooth wine with no bite at the end. It had a light soft finish that encouraged you to drink more and refill your glass. This is a wine that went well with the pork ribs and can be drunk all by itself, sitting on the deck enjoying the afternoon. Spring has sprung and not a day too soon. The winter here has been sucky to say the least. We had the coldest driest January on record, then the wettest February and March on record. I am so ready for warmer and drier weather. 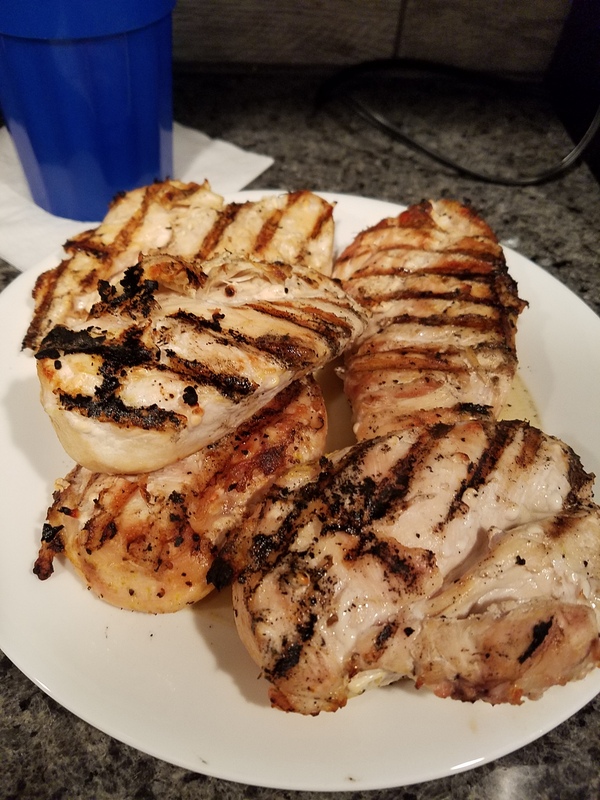 In honor of spring, I fired up the grill and grilled some chicken breasts. Nothing exotic, Lemon Pepper Chicken with roasted green beans and potatoes. 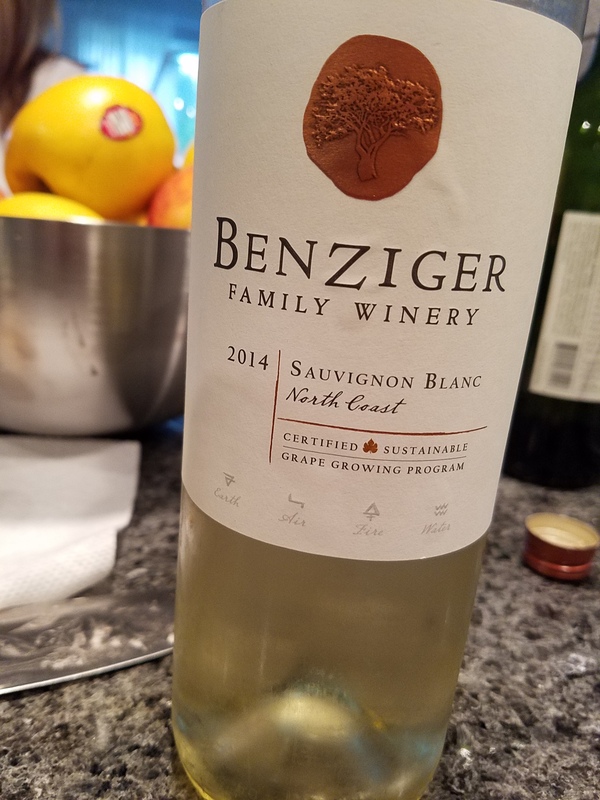 For the wine, I opened a bottle of Benziger, Sauvignon Blanc, vintage 2014. The wine, a California North Coast Sauvignon Blanc was very light, almost clear in the glass and had a dry mineral aroma in the glass. The wine was very dry that tasted like lemons and grapefruit, with a crisp mineral finish. I served it chilled and the light crisp wine went along well with the lemon pepper chicken breasts. This is definitely a wine that I will buy again. 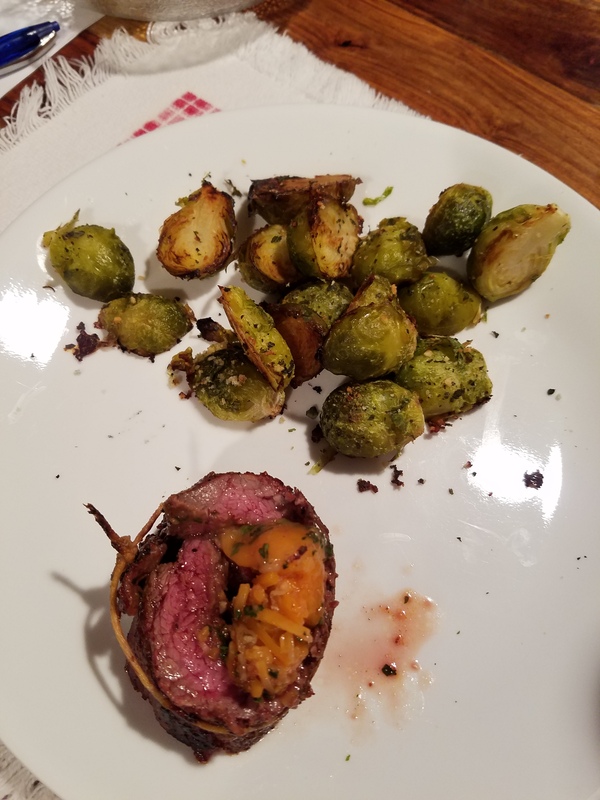 Since most of my wine tasting reviews center around food pairings too, I’ve decided to expand my reviews to include more food reviews. Tonight, I made a special meal, our anniversary dinner. For some, this means dinner out at a nice restaurant, for me making something special and a really nice bottle of wine is more fun and more special than eating out. I know, I’m a glutton for punishment, but I love to cook and create something amazing on a plate. The challenge comes in making something really yummy and amazing with only a few ingredients. 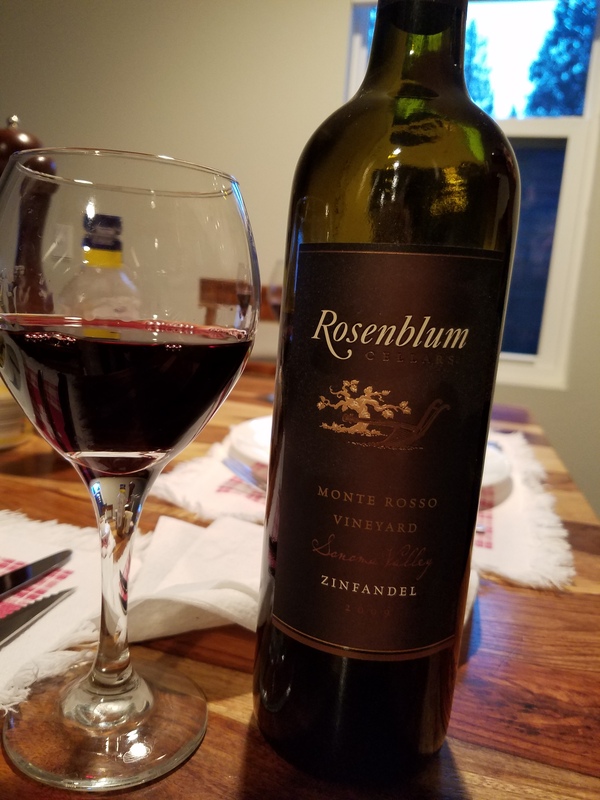 The wine I chose was a 2009 Rosenblum Zinfandel from Monte Rosso Vineyard in Sonoma County, California. This was a bottle I picked up at our local Total Wine for $35. Pricey yes, but well worth the money. The wine was a dark reddish purple color in the glass and very opaque. I could smell plums when I stuck my nose in the glass. The wine tasted like plums and vanilla, with a hint of spice, smooth and full tasting like velvet. 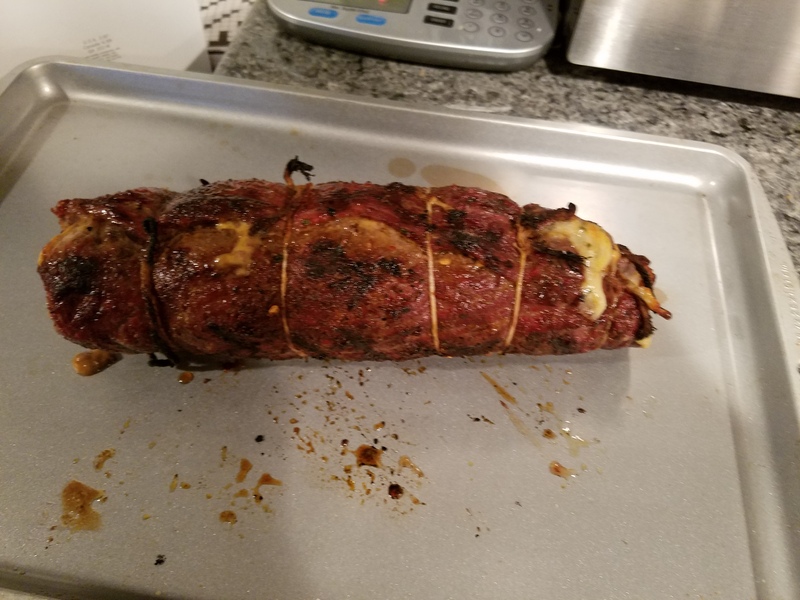 The wine went perfectly with the flank steak. This wine is one of the best Zinfandels I’ve had in a long, long time and well worth the pricey price tag. Christmas is almost here and the weather across the country is frightful. I think most of the country is in the deep freeze, even here where the temperatures don’t usually dip down in the teens. Surprise, I woke up to sixteen degrees and couldn’t get enough clothes on to keep out the chill. So, in order to heat things up a bit, I decided to spice up my cooking. For dinner, I took a couple of slabs of boneless pork ribs and rubbed them down with some hot Jamaican Jerk rub and marinade. Then I roasted them in the oven at 375° for 45 minutes until the ribs were cooked through and quite tender. 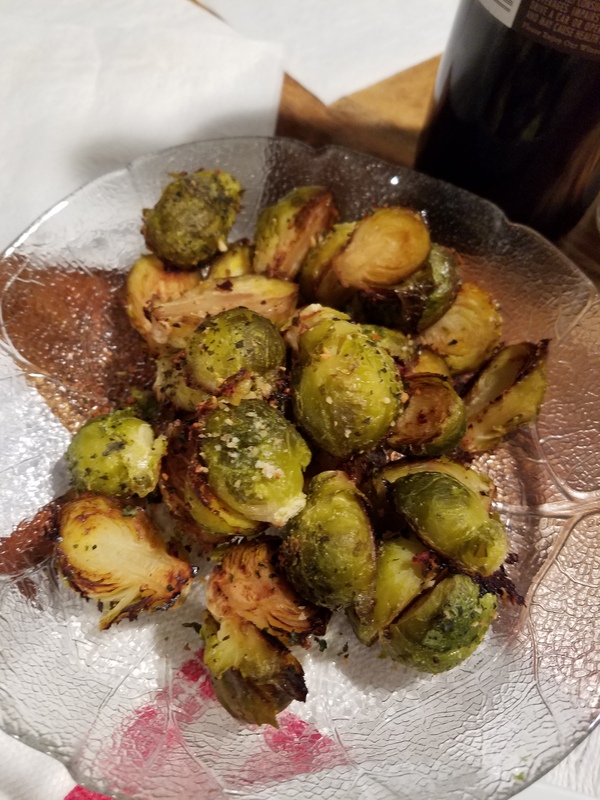 Since the oven was already on, I roasted a cookie sheet of broccoli florets that I drizzled olive oil on and sprinkled with salt and pepper. For the wine, I opened a bottle of Meiomi Nouveau, Pinot Noir, vintage 2015 which I was told was an American Beaujolai. But nowhere on the bottle did it reference a Beaujolai, but it listed the grapes as sourced from 3 different areas, 42% Sonoma County, 36% Santa Barbara County and 22% Monterey County. The wine had an alcohol content of 13.7%. The wine was a red color in the glass and fairly transparent, not as opaque as other Pinot Noirs I’ve had. I could smell cherries and alcohol. The wine had a tart bite and was a bit harsh. It had a dark fruit taste and helped kill the burn of the hot spicy ribs. I prefer the regular Meiomi Pinot Noir, which is much fuller and softer but still full of fruit. I am always on the hunt for new and tasty wines. In the last few years I’ve tried more blends and which has resulted in more new interesting wines. My latest find is a very nice red blend from California. I must admit I bought the wine because of the label. In honor of the season, I ran across a bottle of Gnarly Head Authentic Black from Lodi, California. A Red Blend, vintage 2014, had an alcohol content of 14.5%. The blend is based on Petit Sirah and more undisclosed grapes. The wine was a dark reddish purple color in the glass and translucent. I smelled black cherry and a hint of vanilla. The wine was dry and smooth, with no bite or high alcohol taste that some have. I could taste boysenberry, dark chocolate and a vanilla taste at the end. The wine had a nice full finish, and went down very smoothly and dry without any burn. I was very pleasantly surprised by how well this wine tasted. I will definitely put this on my “to buy” wine list and pick up another bottle or three. The price was also a nice surprise under $15 a bottle. You can find Gnarly Head online at http://www.gnarlyhead.com. Fall has come to the northwest with temperatures in the fifties along with clouds and rain. I had set out a steak to grill hoping for better weather, oh well. For the wine I opened a bottle of Apothic Inferno, a limited release of wine aged 60 days in whiskey barrels. The wine, a California Red Blend, vintage 2014, had an alcohol content of 15.9%. The wine was a dark red color in the glass and had a light smoky smell with a hint of a sweet maple smell. I could smell the alcohol when I stuck my nose in the glass. The wine had a dark cherry taste with a sweet maple note, not overpowering at all, just kind of a tease. I could taste the wood, but it was a soft wood and smoky flavor and a touch warming, almost like a cognac or brandy, but not heavy and strong, just hints and subtleties. The wine was a nice surprise and went well with the steak. It was also a great companion to the chilly weather, like a glass of cognac, warm and inviting. You can find Apothic online at http://www.apothic.com. The wine was reasonably priced at under $15. I’m pretty sure it will go fast, since it is a limited release. While in Kansas City on a recent business trip I had an opportunity to go to dinner with one of my sons along with his wife and children. We went to dinner at a local restaurant that if you live anywhere in the two state region, you’ve either eaten there or have at least heard of it. Strouds is a bit of a legend around there, if you like fried chicken or chicken fried steak along with the fixins’, mashed potatoes and green beans, served family style, then you’ve probably eaten there a time or two. While fried chicken and the crispy fat laden skin is so good, I avoid it like the plague, because if I succumb to my craving I would not stop at one piece of chicken. Lucky for me Strouds now serves a chicken salad that comes with your choice of fried or grilled chicken, blue cheese, hearts of palm, pimento and artichokes. I get it with the grilled chicken and fat free Italian salad dressing. The salad is large enough to satisfy as an entrée and is very tasty. That way I can justify the cinnamon roll at the end. I am trying to eat better, but I am not going to pass up dessert. Dessert and wine, not going to deprive myself of either one. The restaurant didn’t have a wine list, they mainly offer beer and cocktails, but they do have a few wines. I chose the Pinot Noir not knowing the name, just that it sounded like a nice choice on a hot evening. The wine was surprisingly good, soft and smooth, with cherry flavors and a medium finish. I asked if I could see the bottle and take pictures of the wine label front and back. The wine, Canyon Road, Pinot Noir, is a California Wine. The vintage, 2015, which also surprised me, because it was so smooth for such a young wine. I had never heard of Canyon Road Wines, but from what I could find out online, I think I will have a hard time finding a bottle outside of a restaurant. If you are ever in Kansas City and find yourself at Strouds Restaurant, order the Canyon Road wine and let me know what you think. Susan Uncorked Blog at WordPress.com.